Role Manager is here! Make sure your design remains intact long after you deliver the project to the client. You get a call in the middle of the night – It’s your client. Apparently, they played around with your design, and ended up destroying what used to be a beautiful project. This is a common problem for many designers and web professionals. Luckily, there’s finally a solution. 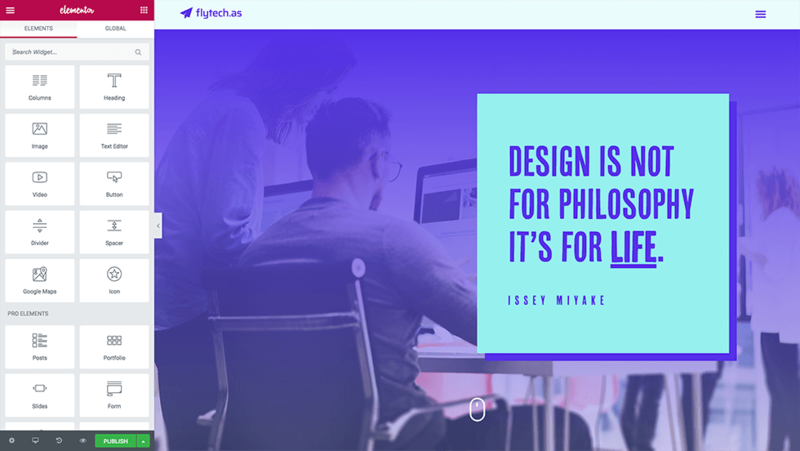 You hand off a completed project to your client, and restrict their access, so the client can only edit the content and doesn’t mess up your design. Role Manager is a new feature in Elementor, enabling you to designate different access privileges for each user role. In the free version of Elementor, you can choose to restrict certain user roles from accessing the Elementor editor. In the Pro version, you can either prevent certain user roles from accessing Elementor, or only allow them to edit existing content inside the editor. In this case, your user will be able to change images, alter text and so on, but the styling and layout of the page will be inaccessible. The user won’t be able to add, delete or drag and drop elements – just edit the current content. Some plugins add new user roles, and these will also be included in Elementor’s Role Manager. WooCommerce, for example, adds the customer and shop manager user roles. You can read more about user roles in the WordPress Codex. No access to the editor – This restricts the user altogether from entering the Elementor editor. 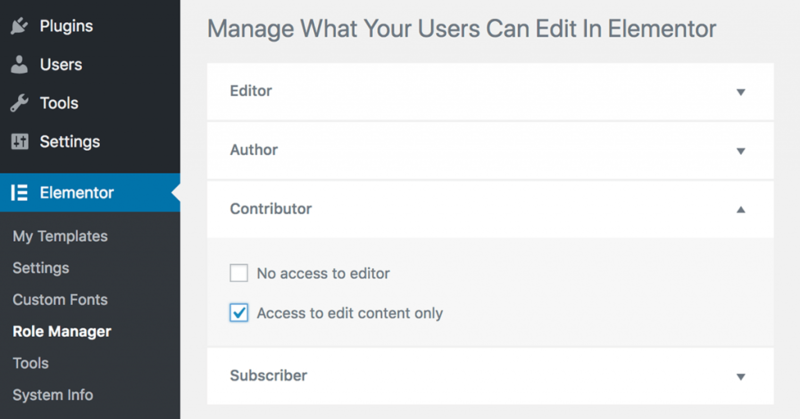 Access to edit content only – This lets the user change the content and not the style or layout. Switch on one of these settings for the user role you want to restrict, and you’re done! Role Manager helps you hand off designs to your clients without worry. Once they approve your work, they can log in to their new website and edit their site content as they see fit. The layout and structure of every page they edit will be fixed, so your design remains intact. Start using Role Manager to protect your designs, work less on maintenance, and focus more on future projects. Final note – I’d love to read any of your past examples of handing off completed projects, only to have your client completely destroy them. Also, I’d love to hear ideas about other restrictions you’d like us to introduce to Role Manager in the future. Love this! Will be super useful. Can a user with Edit Content Only drop in a template to a new page? If not, that would be awesome. Also another level down the road that allows for moving sections and editing content would be cool but not re-ordering columns etc. Wow, thanks God you implemented this feature! I really tired from clients when after publishing website they do changes “here-there” and after I am ashamed to put the recent project in the portfolio. Thank you! It is naive to believe that website owners will agree to use “Editor” accounts without being able to make changes to page structure, and so on. I actually said “Yes!” out loud. This makes things so much better. I’m wondering if it would be also possible to do more granular restrictions on specific things that even though they are “content” you would rather they not edit. Brilliant, this is great! This solves the only real downside of a page builder in my experience – just too many options for the content editor. The other problem we’ve had, is where users accidentally revert to the standard WordPress editor and lose all the layout. This is really good, Congratulations, I was worried about this. And there you surprise me … I am very happy to use Elementor pro for the second year. Awesome! I had used a filter to hook into the editor and hide a bunch of options so that certain user roles only had access to edit the content, but not the styles or modules. However, this workaround still unfortunately allowed for them to drag the existing modules around on the page, changing the layout. No need for those hooks anymore! Hi cass,_i, i have been trying to find a solution for users = author to only have the ability to change the content( text/images) but not changing the layout. saw this reply of yours. Just wondering if you have any idea how i could do it. Well, Elementor (free version) allows you to either enable or disable Elementor builder : i.e. the user that edits the page will either see the default WordPress builder (TinyMCE or Gutenber soon) or Elementor, with all it’s capacity. Elementor Pro has that, but also adds another possibility : changing the content only… So, they have access to Elementor’s builder and can modify images, change the text, etc… But they CAN’T add or delete elements or move them around. So, the layout is preserved. This is all based on user roles. One big problem I’ve encountered way too many times. My client/seo guy try to edit page content through the WordPress editor instead of the Elementor editor. Needless to say they come to me thinking they broke the website. It would be great if you could prevent certain users from switching back to WordPress editor. You can do this without the geest plugin User Role Editor. I use this all the time. In the past I did the layout and content in code, so my clients did not really had the option to edit anything, but the ability to change the content without ruining the layout sounds great! This is great but what do you do when the client already has an administrator account because they are truly the owner of their site? It would not be ethical to downgrade their account but I could see toggling an “edit content only” for a specific account or string of accounts, or the opposite, excluding all except 1 specific user or group of users. I know this makes it more complex but rarely do I have site owners with non-admin accounts so this doesn’t help me too much even though the thought is a nice touch, saving templates and the history helps me when clients goof up the site. +1 for reverting to standard wordpress editor and lose the layout. I agree with pingram. Site owner clients always have Admin roles by definition of being a site owner. They still edit and screw up content. There needs to be an Elementor role restriction for Admin as well. ^^ This is a great idea. * However, the Admin is the highest role on a typical WP site (excluding multi-sites) so you could potentially be in a scenario where all admins are locked out of editing content, and there is no higher role around to “unlock” them. So technically it’s a chicken and egg situation where you need some sort of higher authority account to change the lock status. Perhaps a solution to this could be that you need to add a flag of some kind to wp-config.php temporarily to unlock the admin account, and therefore allow Admin to control the other statuses again. It’s still not 100% foolproof but it would make it a little harder to circumvent at least. WOW! You guys are really pulling out all the stops! The new features in 2.0 (header & footer editor!!) and the “edit content only” is awesome! b) Would also be nice to be able restrict to content only – based on USER (not just on role) – as most clients have Admin Access. Still – you guys are really going in the right direction! Keep up the AWESOME work! Option b) makes a heap more sense because you can restrict not just Subscribers etc. but all other admin account except yours (the web developer). That way there’s a mechanism to unlock the accounts again (provided you don’t lock yourself out either! ), which is where an unlock flag in wp-config.php could help. while still allowing them to create their own? A per user role editor would be great too like Admin Menu Editor Pro so you can give admin role by default on access to full Elementor editor but you can give one user (yourself) full access. Hopefully you see this Ben Pines. It’s a great first step… For now, it is highly restrictive and not flexible… Though I’m not a Divi fan, I dream of the day that Elementor will be comparable to their role manager…! This is super cool and very helpful especially for agencies using Elementor like us. Now, all we need is the option for Whitelabel anyone seconding this feature for the pro version. To me the obvious enhancements to this for the future are page by page control (protect the home page but let them layout new pages they create) and separate control over header and footer (protect the header, nav and footer but let them manage the content that lives within — like protecting parent layouts in Toolset Layouts while letting them edit child layouts). Is there any chance of adding roles to the “template display rules” mechanism so that different templates could be displayed depending on the role of the logged in user or users who are not logged in? Looks great. Waiting for a visual que on the editor for when an item is hidden on a responsive element. New Feature Please. Is there a roadmap anywhere? The Force is strong with this One! Ben, this is a brilliant idea. I’ve used it just form the first time and is a great idea but there is, for me, a big problem realted to possibility that users can export my work. only way to hide elementr menù form dashboard has been to install a plug in that can customize the viisbility of elements in dashboard. Could be great, and better, that also the elementor team develop this feature. having the important possibility to manage the roles but showing the plug in and giving the way to export my work, for me, is not a good solution. Thanks for the feedback. We will take it into consideration. Do you mean the export into the JSON file? I Happen to lose my nerves regularly, when I have finished a client’s project and a couple of weeks later he calls me and expects, that I repair what he has done (wrong). It’s really makes our work easier and especially when we work in Teams. You know, someone cares about the shop and the others create the blog and one members designs and structures the landingpages. You guys think about the things which are necessary – and this I do appreciate a Lot! Thank you again for this great feature. I have just one small question. If we limit, for example, the “Editor” role just to edit the content with is very nice, but I found that there is still an option to save the template, is there an option to import that template? It might be useful for the editors to be able to add some templates and then just to edit the content. It will help in case they want to create a new page in the same style, same boxes, but with new content fro example for a new service page. Or maybe just the ability to duplicate the page? This is brilliant! Been waiting for this for some time. Why is it that some clients are happy to pay for design only to then go and play with it themselves! Thanks Elementor team! In my experience working with the role manager (I got on it to show a client how to edit the page) they could also edit spacers…. Could you please disable that? 🙂 Proper and consistent whitespace is a big part of a good design (that clients will mess up)! Thanks! Haven’t tested it yet but first thought that comes to mind, is the option of a really really slimmed down log in in and minimal interface for client to edit specific content areas and not to see the Wpress menus etc as a normal editor/contributor or be distracted by any options , other those specifically allowed . Like Surreal cms or cushy Cms . The more options a client sees, the more confused some will get, the moretime you spend teaching them, or the more likely some will mes something up! Just to add, while the elementor interface is easy to use for us, but I also mean a really simplified version of that, probably preferably with simple inline editing. Text editing plus optional editing/upload . Who knows what client will make of Gutenberg when it kicks in but EL could have a customisable alternative to that for clients. I want to possibility to let a user edit any post but nu update it or publish it, just a submit for review is enough, that will give me the possibility to give normal users a chance to edit my content. My client can always uncheck the box, It would be great to have that option in My.Elementor.com Account in the Manage License. Here we can view all of the websites that are active, it would be great to have the Role Manager here. Maybe consider adding this option in the Elementor website. What if you want to give the client the ability to modify Elementor widget parameters and content but not let them remove sections or add columns? Elementor is now my favourite front end WordPress site builder – long before this feature, in fact. you guys are doing great! Thank you for continuing to add new features for bot the free and Pro versions! +1 for template-by-template edit permissions. This would be great indeed. Great feature, but what about background images within “access to edit content only”? Or only content in templates, like adding extra posts to the carousel or change the query but not to delete or styling (like removing the Read More link). I’d love to be able to block or allow content access on a page based on WP user roles. I`ve tried it with my PRO setup. BOTH settings have the same effect: I have NO access to the Pages nor to Elementor. Switching between toggles has no effect. Any suggestions ? Nice feature, but an additional option to restrict access to templates (save to and/or load from library) per user role would be very usefull indeed! Any change this will be added soon? Thanks. Hi! how can I restrict contributors from even seeing the elementor section in the WP admin panel? My site is users content based and I want them to have access to adding posts through the wp panel but without seeing other sensitive parts like the elementor section. I am using the Pro version and want the client only to Create Articles and not even see the Edit with Elementor Button or the Models. You can restrict the access to Elementor, so the client will have to create the articles on WordPress. You’ll have to design the single page post template. Matan Naveh, Thanks alot for the Reply. How do i restrict the access to Elementor? I went to Elementor Role Manager and put the Editor, Author with no access to the Editor. But when i log in as Editor or Author User I can see the Edit with elementor Button and in the left Pane i see the Elementor. Don’t worry, once you selected the “no access to editor” option, your client will not be able to edit anything. Watch this tutorial, and you will get all the answers to your questions. You must worry. Deactivated roles can delete all the templates in My library. Hi Juan, that depends solely on your WordPress role manager settings, not Elementor’s. If your client has the permission to delete posts or pages, he also has the permission to delete templates. Elementor’s role manager affects the editor only. Is there any update on a feature to allow specified user roles to ‘add new page(s)’ and place into those some predefined section templates, With content only editing capabilities, in order to give the user role the power to build out the website without having to come back to the developer each time they want a new page/layout instance? Is this already possible? front-end access control would be awesome …. so only certain user roles can view certain areas of the content … this’d be awesome for having teaser content for not logged in users (a bit like quora and other sites do, we’ve had to do this custom in the past). For member type sites, or just getting people to subscribe/signup, this would be awesome. Thank you so much for implementing this into elementor. I don’t have to worry about clients messing around with the design I spend hours on anymore. Thanks for the peace of mind. That’s one thing I tried doing with beaver builder but found no answer. Can we have the “back to wordpress editor button back or switcheable?, right now that button remains available to admins only, and for SEO editors and editors as well, it was a ver convenient way to finish composing a note, adding atributes suche as SEO, tags, category etc. Great Edition, but I Upvote for “More Control” with a way to Turn OFF the Back To WordPress Editor button. It would be awesome if certain users could drag-and-drop and only edit content. And maybe also be restricted to a couple of widgets. Some of our users want/need that functionality. Nice feature! It would be good to add also the option that users could include templates that I have created for them in the Elementor template, for example: to add a banner with a CTA when they launch a campaign, etc.